Despite the growing consumption of electricity, Cambodia is among one of the few countries in the region that has low access to electricity. In fact, Cambodia has one of the lowest electrification rates at just 60 percent nationwide. Only 62 percent of villages and 53 percent of households have access to grid quality electricity in the country. There is also a large urban-rural divide when it comes to who has electricity access. Almost the whole urban population in Phnom Penh has access to electricity while only half of the rural population has ready access to it. The majority of the Cambodian population falls into the lower income group and live in rural areas. Enter hydropower. With the Mekong River flowing through the country, it is no coincidence that hydropower is the country’s main source of energy accounting for more than 40 percent of total electricity generation. That figure could go higher in the future as there is still plenty of untapped hydro potential, especially in the lower Mekong area. Noticing this potential, the government there has encouraged the construction of dam projects along the Mekong so that the government can fulfill its target of achieving 100 percent electricity access by 2020. Among the biggest financiers of the country’s hydropower projects come from China. As part of China’s massive Belt and Road Initiative (BRI), a number of Chinese companies have received approval from the Cambodian government to build hydropower dams across the Mekong. In 2016, Cambodia saw the construction of six hydropower dams and all of them were built and financed entirely by Chinese companies. Recently, hydropower projects in the region have come under heavy scrutiny after Lao’s dam collapse which killed over 30 people. Many are beginning to question the safety standards of dams constructed in the region. There are various reasons behind the Lao dam collapse. Some blame the shoddy design or construction, while there are others that pin it on climate change and the resulting heavy downpours. With the Cambodian government looking to construct many dams quickly, safety could be a legitimate concern. There is also worry that the construction of these dams could have an adverse impact on the Mekong river. Construction of dams along the Mekong raises immediate risks for fisheries, farming, and food security in Cambodia as multiple upstream hydropower dams disrupt flood cycles, nutrient flows, and sediment transport. Even the government has acknowledged this. According to Nao Thuok, a Secretary of State at the Ministry of Agriculture, Forestry and Fisheries, the Cambodian government is currently operating on projections of a 16 to 30 percent drop in fish biomass. This loss in aquatic life would not just affect the natural life of the area, but also surrounding the communities. The people who live around areas slated for these proposed hydropower projects could potentially lose their livelihoods and also have their homes affected. 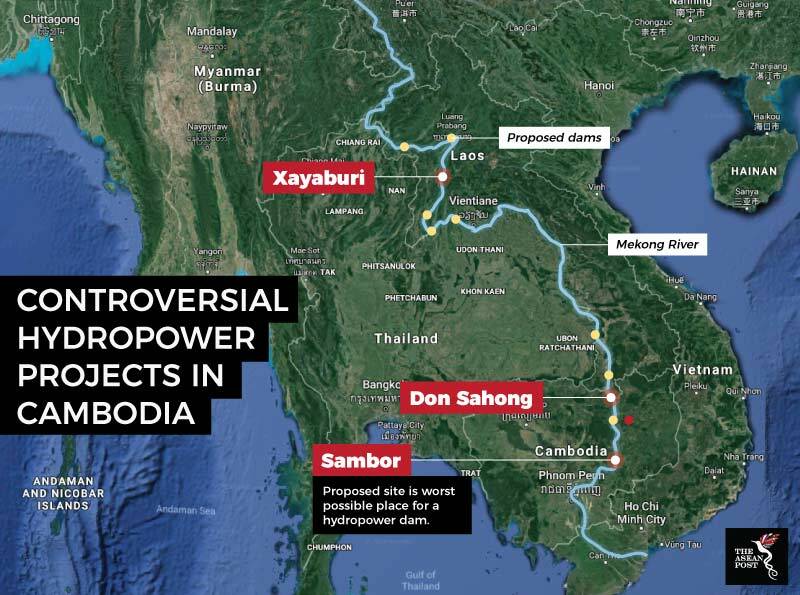 In June 2018, a leaked environmental impact assessment report revealed that the proposed Chinese-backed Sambor Hydropower Dam could “literally kill” the Mekong River. The report that was commissioned by the Cambodian government and carried out by US-based National Heritage Foundation was kept a secret by the Cambodian government prior to the National elections last month. The Sambor Hydropower Dam was singled out in the report as the “worst possible place” for a dam. The construction of the dam could kill off most aquatic life surrounding it – most notably the Irrawaddy dolphins. The report recommends that Cambodia look into solar energy instead. “Solar energy is the only option with a positive net economic benefit after all costs and benefits are taken into account, and the cost of solar would be cheaper than the best possible mitigated dam,” said the report. Increasing access to electricity is a necessary move by the government but it cannot come at the expense of the environment. If the Cambodian government decides to go ahead with its hydropower projects, then proper planning must be put in place. Moves to mitigate the potential damage to the Mekong must also be carried out as well.